Hello, friends. Hej! Konnichi wa! 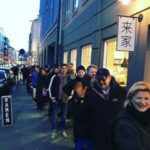 We are "Ramen to Bíiru" from Copenhagen, Denmark. "Ramen to Bíiru" began as a collaboration project between a craft beer producer Mikkeller and a Japanese restaurant Bento. It's a cosy and welcoming place where you can enjoy both ramen noodles made by our trusted Japanese chef, and a globally renowned Danish craft beer. As of July 2018, patrons of our restaurant can choose from 14 different kinds of ramen, with the miso-base one being in highest demand. In "Ramen to Bíiru" we self-produce noodles on a Yamato-made LM10062ICE type machine using locally sourced flour. When we just started our project we had no prior experience in noodle-making, but team Yamato's earnest efforts to help us with basic recipes and teaching materials in English, and prompt answers to our email questions convinced us we can work with them. At first, we did have our share of anxiety about relying on a company half a globe away, but in hindsight, we are happy to have chosen Yamato products and services.